Location: 5-star establishment, the Sheraton Grand Pune, is a 25-min drive from the Pune Airport and a 5-min walk to Pune Railway Station. City's popularDarshan Museum is just 2 km away, Aga Khan Palace (6 km) and its a 15-min drive from the hotel to the 8th century Pataleshwar Cave Temple and Shaniwar Wada Fort. 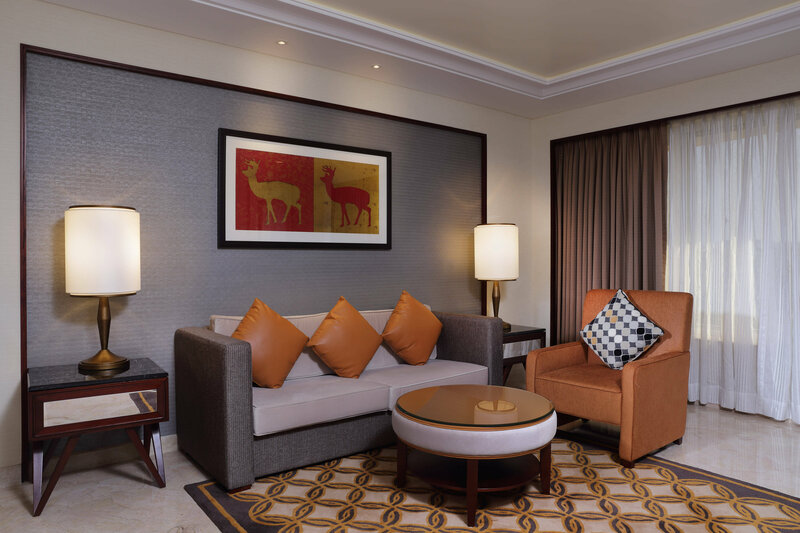 Room Amenities: Sheraton Grand Pune offers 177 rooms categorised as Classic Rooms, Club Rooms and Executive Suites with city view. The standard amenities include an LCD TV with DVD player, mini-bar, individual climate control and electronic safe. Hotel Facilities: These include outdoor swimming pool, fitness centre, Shine Spa, Jacuzzi and salon. Front desk services include concierge and tour desk. Guests accompanied by kids can avail the babysitting and child services at the hotel. Dining: These are Feast (international), Bene (Italian), Chingari (Indian cuisine) and Link (bakery). Other options include the poolside Roof Top Bar and Entresol Bar, serving a variety of alcoholic beverages and snacks. Hotel is well placed in Pune near to railway Station send not far from Airport. Staff helping and hosting. Nice facility, surrounding area is congested due to opposite to Station. Other ways heart of City. Visit this hotel on a single day trip to Pune, disappointed that first a room was given where continuously I could hear drilling and hammer noise had to ask 6 times before I got a room change. I appreciate that a room change was given but why is it so difficult to understand that not to give guests room which are next to renovation area. The breakfast was good and the rooms were well appointed with all amenities in place. Just one downer room, the bathroom door was not getting locked. kindly get this checked. Not expected from a excellent star. Visited this hotel on a single day trip to Pune, disappointed that first a room was given where continuously I could hear drilling and hammer noise had to ask 6 times before I got a room change. I appreciate that a room change was given but why is it so difficult to understand that not to give guests room which are next to renovation area? The breakfast was good and the rooms were well appointed with all amenities in place. Just one downer room, the bathroom door was not getting locked. kindly get this checked. Not expected from excellent star. Location not good. Food and service very good. All was excellent. Nice experience. Good comfortable stay. 2 cockroaches located in the empty glasses, disgusted. Had problems while checking out due to elongated procedural time. Was a pleasant stay. The staff is really polite and helpful. The staff was very pleasant and courteous. The hotel has an excellent location, bang in the middle of the bustling Town. The breakfast spread, though lavish, left much to be desired on the taste front. Needs to be improved. It is not same. The room was pretty small and crowded with the required furniture. The exterior wall, visible from the window, had not been cleaned in ages it seemed. A pleasant return to the former Le Meridian Property. Location is a disadvantage otherwise Sheraton Grand is a nice place to stay. Front office staff were very courteous even at midnight and so were the restaurant folks. Room and facilities were exactly what we needed. Nice lounge and gym facilities were also good. Hotel was good, location was good, though exterior cleanliness needs to be looked into. Overall good stay. Great stay. Very polite and helpful staff. Excellent service. Overall nice place for relaxation. To stay in this hotel is like an amazing experience. All the things in the room look like perfectly placed. Food was awesome, hotel was in the city center from where you can go to any part of city. Everything was just awesome but I was expecting bathtub but there were no bathtub. Really no words this time to explain how wonderful experience to spent a day actually, I planned to surprise my wife as her birthday as soon as we check in the Sheraton Grand as Sheraton Grand officials got to know about the birthday they just gave us the best. I could get how wonderful service I get I would ever imagine it firstly, I would really like to mention the names of the officials as chandani, sanjay, james, seema, urvashi these are remembers names but whoever come across us give us warm welcome and wished my wife so let me tell you as. I booked club room with dinner and breakfast package club room offers 6-8 pm complimentary beverages, starters unlimited they are really superb and guy at restaurant give us nice serve with it then we move on to dinner really nice and wonderful dinner at feast restaurant the manager and serving boy was very pleasant. Over there are no words for grill prawns and fish then after the officials arranged cake in the reception area complimentary from them and they all gather to celebrate birthday with us. I really wants to say that if you want to celebrate your day then it has to be this Sheraton Grand I will be really looking forward to visit this Sheraton Grand again and again I am totally satisfied with the service. Thank you. We visited the Sheraton Grand for a weekend Vacay as we were in Pune for the festival of Ganesh Chaturthi! The overall experience at the Sheraton Grand was beautiful! Hospitality was to the T! The pool could've been better and more spacious! The housekeeping staff were timely in handling our requests. Great Rooms and Great Service! The only think they could work on is its breakfast which wasn't up to the mark considering the standard of the Sheraton Grand! The Sheraton Grand staff was very courteous and excellent! The location of the Sheraton Grands restaurant is really apt and doesn't involve too much of walking around looking for the place! I used to stay here years ago and the room has definitely declined. The first hour in the room we waited for someone to help us with internet access which was not connecting. Then we find out the wifi is Rs 700 per day. I was surprised because I have stayed at the Sun n Sand several times and they always give free wifi. We also had a lot of trouble with the TV and remote. I understand they are changing to the Sheraton and will be renovating. Probably very timely. I would not recommend the Sheraton Grand as is for the price - even with the deal - until they renovate. We came to celebrate our sort of 2nd honeymoon there and stayed for just 1 day. We got a deluxe room with complimentary dinner and breakfast of 2 pax at 9 k. Though it's not too costly but still could have been a little cheaper. Location is good with it being at main road. Had an awesome spa service. No entertainment or even a garden or even a terrace to enjoy the sight. Food was alright.. Buffet with north Indian, Italian and Chinese cuisines with focus on non veg, was nothing great. We had come here for a night and the kind of service given was fantastic... I had to interview a few people and they offered me a small private area just next to the reception which was very much ideal... In-room dining, rooftop swimming pool, superb spread in buffet breakfast, supper clean rooms, everything seemed to be just perfectly placed.. If I come to Pune will definitely stay here again. Highly recommended property. It was a while since my family visited a 5 star Sheraton Grand for a stay, hence I decided to surprise them with a stay at this place. The staff was courteous, except the one at the reception counter which was a bit stubborn. Nevertheless, the rooms were good, clean and refurnished. Kudos to the complimentary morning breakfast, which was a cherry on the cake. Overall, a happy and peaceful stay. Had a pleasant stay at the Le Meridien in Pune. Some of the big positives of the stay include; the excellent location - very centrally located in Pune, the rooms and amenities were really above par & best of all I loved the bed and linen in the room. The only negative I could think of is that there is a fair bit of construction activity going on the outside of the property at present. They certainly are matching their standard of SPG group and Sheraton Grand Pune has maintained their service standards. Great variety in breakfast and other meals too which was great. My weekend getaway with parents was made memorable was given an upgrade to suite. Would remember their gesture for long and would love to come back soon. Keep up the standard and good service. The location of the Sheraton Grand is excellent and the customer service is very good. Had a pleasant stay and the food provided by them is excellent and tasty. The rooms are clean and neat and wonderful ambience. I will recommend my friends for this Sheraton Grand. As we say first impression is best impression this Sheraton Grand is one such and has a comfortable stay. Property - centrally located. Located next to a station. Excellent staff and good service. Staff was very friendly. Visited Pune after 8 years. It was called meridian back then. The Sheraton Grand still maintains the same standard. The Sheraton Grand is excellent. No words for the Sheraton Grand. The accommodation, value for money, food location all are excellent. If anyone going for the first time in Pune, I would say stay in Le Meridien. I would love to stay once again if I would be coming to Pune or anywhere I would prefer Le Meridien. Very nice service. Rooms are clean. Arrangement for family and single are so well manage. So no one can disturb. Staff are very helpful. Decorative design which showing Maratha culture. It also handle food and other services. Stayed there for the new years eve. The room was too small and the furniture was stuffed in different directions and places due to lack of space. I did not expect this from Such a brand. It was very inconvenient. Other than the room, everything was fine. It was superb, they provide excellent services. Absolutely gorgeous fOOd, very gOOd staff and amazing customer service! Everything was superb .. .. We will stay in this property only whenever we will visit Pune, food was awesome, rich Sheraton Grand with every kind of facility, huge property with all luxurious looks ... Best property I ever visited in Pune. An unforgettable experience, a tremendous service, the financial adjustments made, the location, the dining restaurant, the irreplaceable breakfast, multi cuisine restaurant and state of the art architecture. Beautiful hotel with excellent services ..
Beautiful Sheraton Grand with excellent services and food was delicious with variety ... Staff is professional and helpful. They helped me to early check in and late check-out without charging any extra moneyI would love to come back any enjoy the hospitality. people at check in were not very impressive. Its good value for money stay. Room is very clean. I like it. View is amazing in room. Interior is also cool. Room service is good. I love the food. I definitely want to visit again. Staff is very cool. Value for money. The experience with sheraton is amazing. Excellent Sheraton Grand, good service, very well mannered and polite staff, food was amazing, ambience was mesmerising, I stayed here for 2 days but felt that my stay was too short, I will definitely visit this Sheraton Grand again.